‘I want to write children’s books.’ I suspect that the number of people who think or say that and the number of people who actually do it are quite far apart. It was only when I challenged myself to stop thinking it and start doing it that I moved from the ‘want to write’ to the ‘writing’ brigade. The more I reflect on making this jump, the more I believe that there is an element of truth in the notion that if you really want to write, and I mean really want to write, then you will write because you feel you have to. Something inside you drives it and it becomes too uncomfortable to not be writing. If you continue to think or say that you want to write but you don’t do it then you don’t really want to. This sounds a bit harsh but it was only when I began to make sacrifices like changing my hours at work that I was finally able to write. Even then it was hard to do, but until I prioritised writing during the week it didn’t have a fighting chance. Why write for children? This was something that had been in my mind for around fifteen years but it is hard to pin down just why the idea lodged itself in those student days. After graduating I gained some confidence that I could get the pitch right when I began to work with children on environmental projects. Some of this work involved developing characters for various activities and events, and in one instance I wrote a play which toured primary schools – but then this all got lost somewhere along the way. It was only when I attended a course run by my church that I realised that writing for children remained something that I really wanted to do but had never done – that the final ‘well, are you going to do this or not?’ moment came. At the same time a BBC Talent competition appeared looking for a first chapter of a children’s book. So I wrote the first chapter of Catscape, under the name The Databoys. 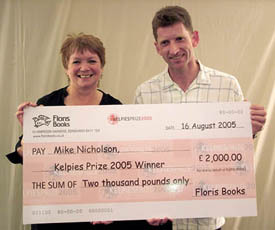 A few months further on I found that I had made the initial shortlist of twenty from 4000+ entries. The letter I got telling me this said ‘keep writing, you will succeed.’ This was a key moment as I gained the confidence to continue and I know that this affirmation that I had got the pitch right was vital. I decided to finish the book but didn’t know at that time that it would take me a further three years. Life was busy in work (running an association for volunteer-based befriending projects) and out of work, with various voluntary commitments. My son Joseph was born around this time too so my hands were increasingly full. It was only when I created a specific time to write (Monday mornings), got involved in a writing group (gaining encouragement and accountability) and got a deadline (the Kelpies competition) that Catscape was finally completed. I now know that without this structure, without accountability and deadlines, I would never have done it and could never do it again, no matter how much I had the ideas to write about. It sounds a bit dull but it’s certainly an essential formula for me. The book that eventually emerged came from a combination of factors. I suppose the same must be true of every book. Having made the decision to finally put pen to paper for the BBC ‘write a first chapter’ competition, I needed inspiration for a storyline. I soon found that it was staring me in the face. There were lots of lost cat posters around Comely Bank / Stockbridge (in Edinburgh, where I lived) and I wondered why that might be. It was a simple idea and one that allowed a story to grow in all sorts of directions. It makes me wonder how many other ideas are just outside the front door if you only open your eyes and ask the right questions. In terms of style, I didn’t really research in any detail what books were on the shelves for children. All I did was check a rough word count for a standard length of book. I was aware that I was ignoring some accepted wisdom about writing by not immersing myself in books for the age range that I was writing for. I was a bit fearful of losing my originality by even subconsciously copying what others did, so I avoided looking at other books. It didn’t take much of a glance however to note that there were lots of mythical or fantasy books and also lots of books dealing with difficult issues that young people might face. I knew that neither of these areas was what I wanted to – or felt I could – write about. I was keen to write something of the type of book that I myself loved as a child – although again I found that I was ignoring standard advice, which suggested ‘don’t write the type of book that you liked to read when you were young as times, interests and values have changed.’ On reflection, I believe that you have to enjoy what you are writing and if you do it well enough, if you create characters that people want to read about and situations that fill the reader with enough curiosity, intrigue or amusement to turn the next page, then seemingly old approaches can still be fresh and enjoyed by readers today. And anyway, if those old books are so ‘out of date’ then why do young people still enjoy them, and why are they called classics? When I was a young reader I loved mystery and adventure stories. 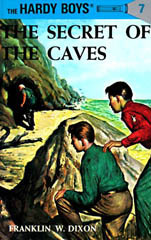 My favourite was the Alfred Hitchcock and the Three Investigators series, with probably the Hardy Boys puffing some way behind in second place. My favourite TV programmes were mysteries and adventures too. I loved Dr Who with its strong characters, gadgets and cliffhanger endings. I suppose looking back to when I was even younger, Scooby Doo with its investigations, secret passageways, villains and ‘pesky kids’ was a firm favourite. The original idea for the story came from a question: ‘Why so many lost cat posters?’ I subsequently found asking questions to be a good way of prompting the story whenever I got stuck. I would write down questions like ‘How does Fergus meet Murdo?’ ‘How could the boys delay that character long enough to sneak a better look at that place?’ Sometimes I would take one of these questions on a long walk, pushing my son in his pram, and come back with the answer I needed to kick off the next stage of the book. In many ways I felt I was piecing together the mystery myself and at times the dialogue simply reflects my own thoughts as I tried to unpick the situation they were faced with. I’ve been asked if I have a particular affinity with cats which led to the book’s topic. The people that know me well will be amused to see me answer this question as I am not known for being a big fan of cats. 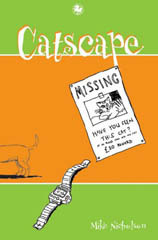 In fact some have accused me of deliberately enjoying writing about cats going missing. That’s not true! It just seemed like a good idea for a mystery! Setting the story on my doorstep around Comely Bank and Stockbridge provided me with a ‘set’ that was easy to visualise and so locations and events easily came to mind. I embellished the area a bit with other things that interest me in the city – the idea of the vaults for example came from seeing a diagram of the area below South Bridge in the city centre. Perhaps it helped that I was also physically writing the book in the area in which it was set. I live in a small flat with a computer in a cupboard, so, although it’s beginning to sound a bit clichéd, large parts of the book were written in Stockbridge’s coffeeshops or even on park benches, and again the area came to life on the page. At the moment I am writing something else and I sincerely hope that it won’t take another four years to reach the point where I type ‘The End.’ I had the idea for it a few months before I finished Catscape and I enjoyed finally getting into thinking about it the week after I handed my manuscript into the Kelpies competition. It felt like I’d been storing a really good box of chocolates and got to open them on a special occasion. I feel like I’m branching out in terms of the style and depth that this story will cover. Maybe that comes with the confidence that one book is under the belt. I do have it in the back of my mind that Fergus and Murdo from Catscape could yet reappear, although I don’t want to force them to unless they have a good reason to return. At the moment I can’t see it being set quite so close to home again, but you never know.